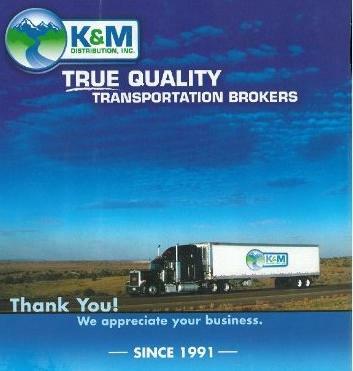 K & M Distribution is a licensed and bonded transportation broker located in beautiful Southern Oregon. We are a family owned and operated transportation/third party logistics firm. Our primary commodities shipped include nursery stock and seasonal shipments such as produce, holiday greens, pumpkins, and Christmas trees. We have been shipping to and from all points in the US and Canada for over 25 years. Having over 3,000 reliable carriers available to us (refrigerated, dry, and flat bed units) it's just a matter of finding the right fit for your shipment. For the convenience of our customers with less than full truck loads, we consolidate partial nursery stock shipments year round out of the Pacific Northwest. As a quality transportation provider we are a superb principal broker as well as an excellent backup. Our foremost objective is to tailor freight movements to our customer's specific needs while providing consistent customer service.